If we think of Revolutionary and Napoleonic France, many things might come to mind: "Liberty, Equality, and Fraternity," Marie Antoinette and her unfortunate dietary recommendations for the poor; La Marseillaise, the Guillotine, the Terror; Napoleon's rise and coronation as Emperor; his great enemy, the British Royal Navy and its tragic hero, Admiral Horatio Nelson; great pitched battles fought with musket, cannon and saber, and of course the brutal retreat from Moscow, when 400,000 French and allied troops starved and froze to death in the Russian snows. 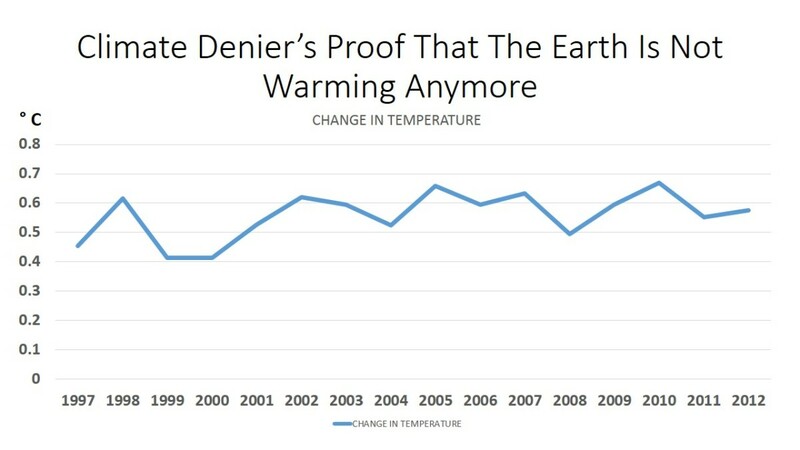 The science of global warming, however, would not be likely to appear on most lists of such associations. 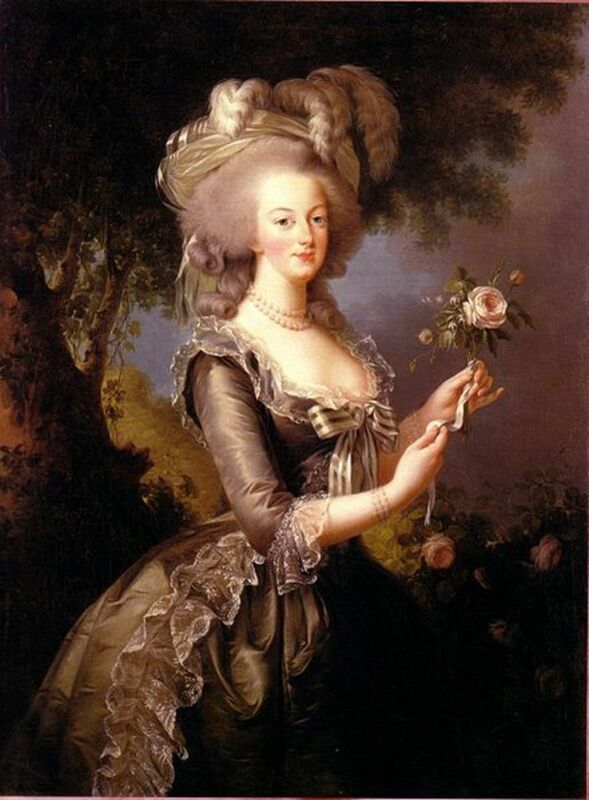 A famous portrait of Marie-Antoinette by lisabeth-Louise Vige-Le Brun. Yet there is a connection, in the person of Jean Baptiste Joseph Fourier. Born into a tailor's family of in 1768 in Auxerre, a hundred miles or so southeast of Paris, he was the twelfth of an eventual fifteen children. Orphaned at the age of ten, he was educated first by the music master at the cathedral school, and the great promise he showed there led to his admission, at twelve, to the local Royal Military School. It was there that the most constant passion of his life--the passion for mathematics--began to blossom. As the natural ideas of equality developed it was possible to conceive the sublime hope of establishing among us a free government exempt from kings and priests, and to free from this double yoke the long-usurped soil of Europe. I readily became enamoured of the cause, in my opinion the greatest and most beautiful which any nation has ever undertaken. Revolutionary politics, however, were as dangerous as they were idealistic. The Terror, Robespierre's campaign of wholesale executions, seems to have prompted Fourier to attempt, unsuccessfully, to withdraw from the Committee. He was left no alternative but to attempt to ride the tiger of factional conflict. In this, "Citizen Fourier, a young man full of intelligence and zeal" was aided by an ability to "talk very well." Yet by the fall of 1795 he would be imprisoned twice, and would endure a real prospect of execution by guillotine. It would have been a tragedy more than personal, had factional politics removed a head later so productive of original and highly useful mathematics. Though politics produced hardship and terror for the young Fourier, it seems quite likely that they were also responsible for his 1794 nomination to the École Normale in Paris, where he was able to study under Laplace and Lagrange, two of Europe's leading scholars. This greatly advanced his scientific and mathematical researches, and in turn soon led to an appointment at the École Polytechnique, where he would gain renown as an outstanding lecturer. He remained there until 1798, when his next great adventure began, as he joined Napoleon's invasion of Egypt in the capacity of scientific advisor. The invasion began well for the French, with quick victories leading to control of the Nile delta. But on August 1 the British fleet, commanded by Admiral Nelson, changed that. 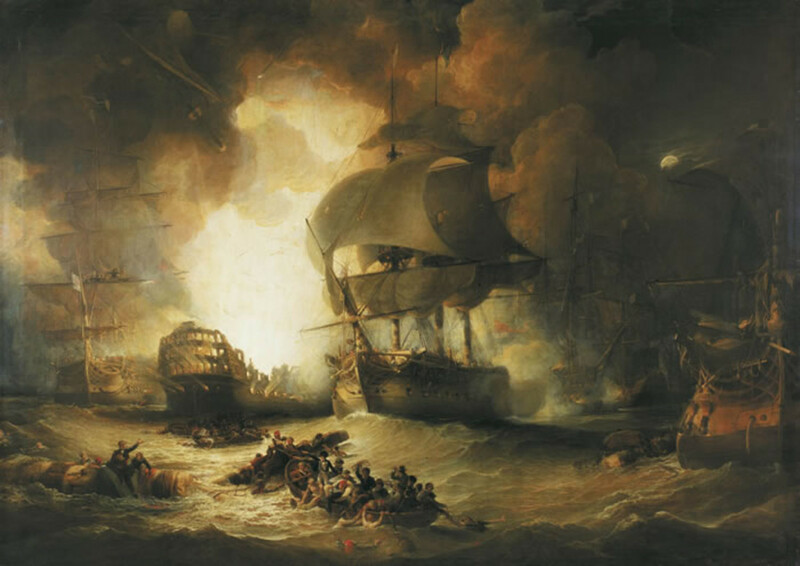 Though the larger French fleet was moored in a defensive line protected by reefs at Aboukir Bay, the British were able to find ways to attack their ships piecemeal. The spectacular explosion of the French flagship, the 120-gun L'Orient, provided the bloody affair a dramatic focus later painted for posterity by George Arnald. The Battle of the Nile was decisive: Nelson nearly annihilated the French fleet; British naval superiority was firmly established for the duration of the Napoleonic wars; and Napoleon--and with him, Jean Baptiste Joseph Fourier--was stranded in Africa.
. . . the Prefect of the Department of Isère having recently died, I would like to express my confidence in citizen Fourier by appointing him to this place. 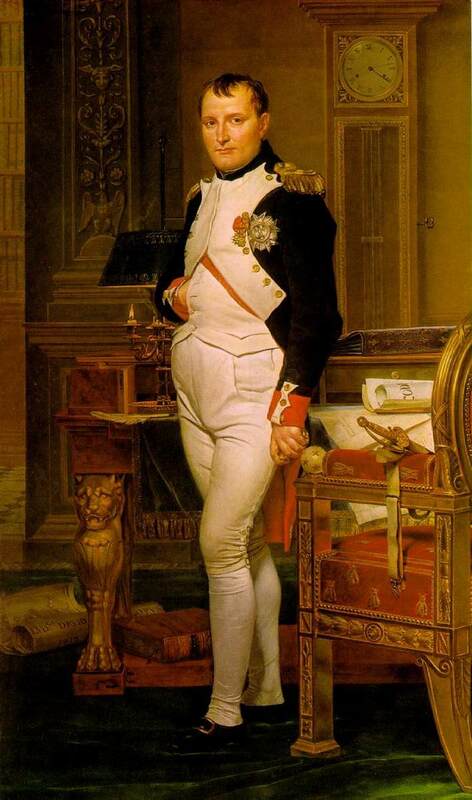 Though for Fourier this must have seemed like an exile to the provinces, one did not say "no" to the Emperor-to-be, however much Napoleon might still use such Republican forms of address as "citizen." Moreover, Fourier's elevation to Baron and Chevalier of the Legion of Honor could hardly have seemed a disadvantage. 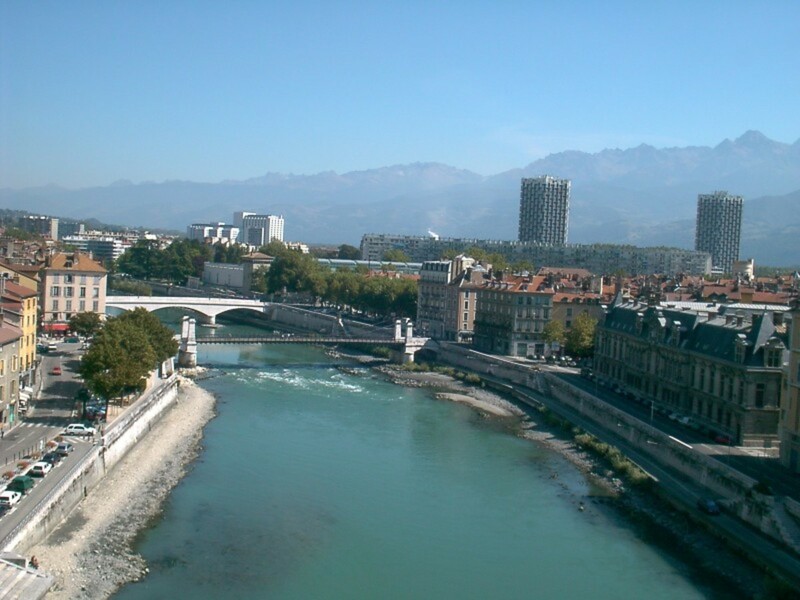 Grenoble, the capital of the Department of Isère, presented a very strong contrast to Egypt. Fourier had experienced the heat and aridity of Cairo, where rain is extremely unusual between April and October, and the temperature will often reach 35 C (95 F) or higher. In Grenoble, he would rarely feel temperatures much above 21 C (70 F), though on occasion 30 C (86 F) was possible. Better yet, each month in Grenoble could normally be expected to provide at least a few welcome days of rain. Surrounded by mountains, Grenoble is often called "the capital of the Alps." It is not too surprising, then, that in between supervising such projects as draining marshes or building highways, writing his portions of the famous Description of Egypt (strategically edited by Napoleon before its publication in 1810), or creating the highly original 1807 paper known in English as On The Propagation Of Heat In Solid Bodies, Fourier at some point encountered the work of a Swiss Alpinist and scientist named Horace-Benedict de Saussure.
. . . a vessel covered with one or more plates of glass, very transparent, and placed at some distance one above the other. 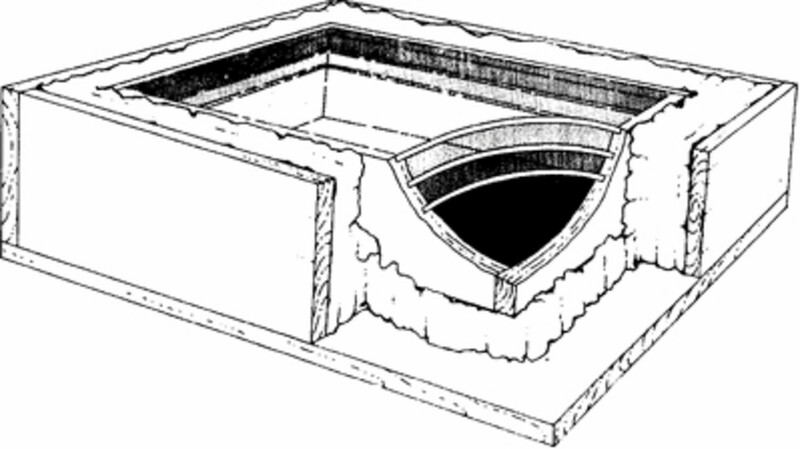 The interior of the vessel is furnished with a thick covering of black cork, proper for receiving and preserving heat. The heated air is contained in all parts, both in the interior of the vessel and in the spaces between the plates. Thermometers placed in the vessel itself and in the intervals above, mark the degree of heat in each space. Every theoretician needs experimentalists to provide solid data, and Fourier appreciated the "capital experiment" carried out by "the celebrated traveler, M. de Saussure." Though the Grenoble years were busy ones, they offered, for a time, relative tranquillity. Yet the political troubles of the wider world would revisit Fourier soon enough. On June 23, 1812--coincidentally, just five days after the upstart government of the United States declared war on Great Britain--Napoleon commenced his invasion of Russia. By November, his Grande Armée had been smashed, and along with it, his reputation as an invincible general. By the end of October, 1813, Napoleon had fought and lost the battle of Leipzieg. At stake had been control of his German territories. 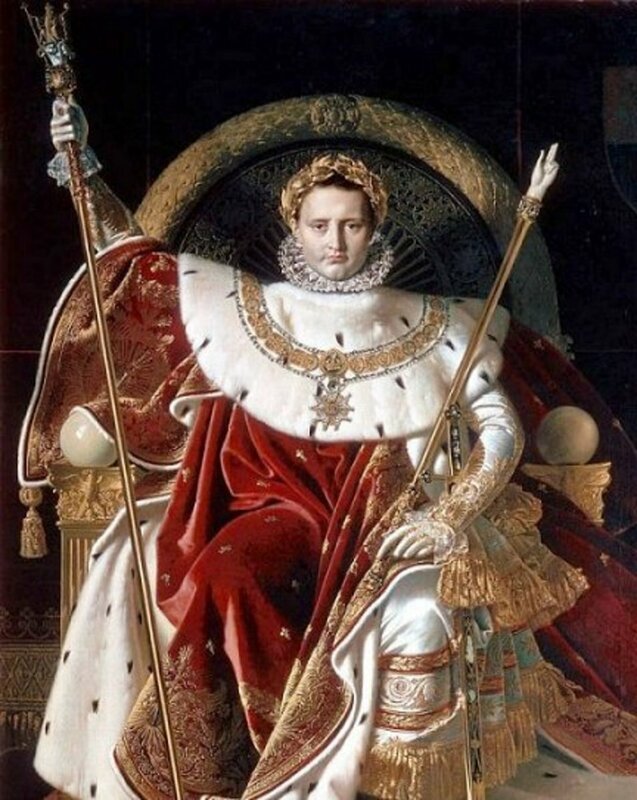 Despite the military brilliance the Emperor displayed during the Six Days' Campaign in February of 1814, he was forced back upon Paris and abdicated the Imperial throne on April 6. Exiled to the Italian island of Elba, the defeated Emperor should have passed through Grenoble en route from Paris; but Fourier, not wishing to see Bonaparte, sent word that this would be too dangerous for his old patron. The maneuver was successful, and Fourier presumably heaved a sigh of relief. It would be less than eleven months, however, until Napoleon would return to Paris from exile, marching once more through Isère. This time Fourier, who had spoken against Bonaparte in support of the restored Monarchy, considered it wiser to flee. Perhaps Fourier's old gift, the ability to "talk very well," came into play once again, for despite these incidents, Napoleon briefly appointed Fourier Prefect of the Rhone, and later granted him a pension of 6,000 francs. Unfortunately for Fourier, it was to have been payable from July 1, 1815--a week after Napoleon's second and final abdication, following the battle of Waterloo--and Fourier never received any payments. Fourier returned to Paris and was elected to the Académie des Sciences in 1817, becoming Secretary of that body in 1822--the year following Napoleon's death at St. Helena. Fourier's remaining years were marked by nothing worse than scientific controversies, and he died in 1830 of unspecified causes--possibly as the consequence of a fall. . . .marks an epoch in the history of both pure and applied mathematics. It is the source of all modern methods in mathematical physics involving the integration of partial differential equations in problems where the boundary values are fixed. In other words, Fourier was vitally important in the further development of calculus as a tool to study diverse problems in physics. 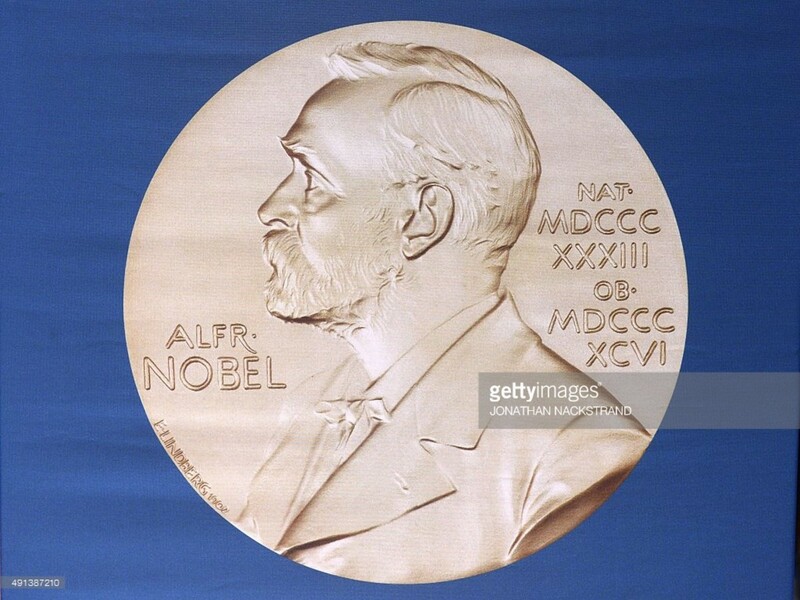 Today the series bearing his name is important in fields as different as data analysis, biosciences, and acoustics, in addition to the problems in the propagation of heat to which he originally applied it. While the Analytic Theory of 1822 is often considered to be his masterwork, a less mathematical summary can be found in his 1824 paper, General Remarks on the Temperature of the Terrestrial Globe and the Planetary Spaces. (The English translation used here is the 1837 version by Ebenezer Burgess.) 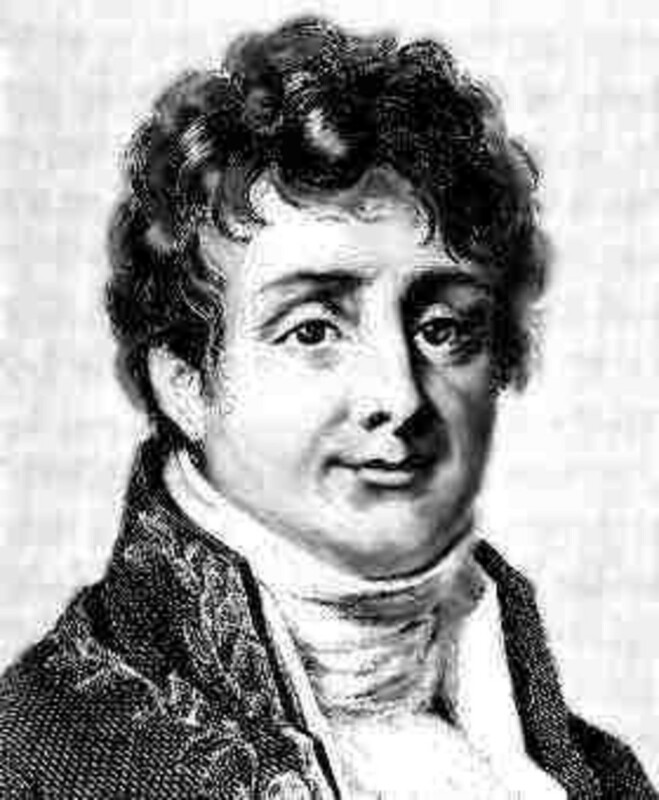 In it, Fourier sets forth several ideas that would prove fruitful or prescient. Firstly, by attempting to catalog and evaluate all factors affecting the Earth's temperature, he in effect provides an early example of a planetary energy budget. Like most first attempts, it was not entirely successful. There was too much as yet unknown--a fact that did not escape Fourier, although he could not anticipate precisely what all of those unknowns might eventually turn out to be.
. . . we conclude that, from the Greek school at Alexandria, till the present time, the temperature of the surface has not diminished, on this account, the three hundredth part of a degree. Here again we find that stability which the great phenomena of the universe every where present. Secondly, and as discussed above, he provided a highly specific model for the application of sophisticated mathematics to the study of the propagation of heat, using precisely measured physical data, such as those provided by the temperature measurements of Saussure. Further, this difference, demonstrated in Saussure's heliothermometer, "explains the elevation of temperature caused by transparent bodies."
. . . the temperature rises till the heat flowing in, shall exactly equal that which is dissipated. . . 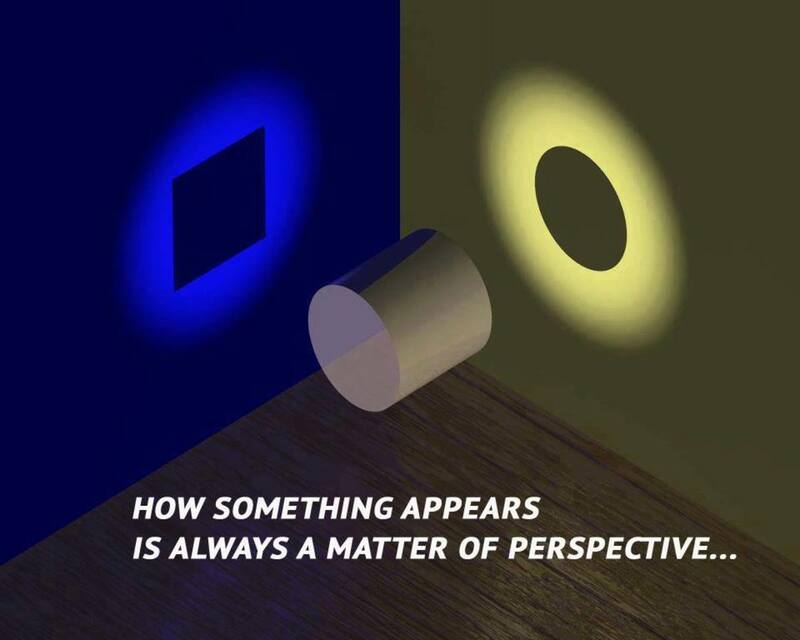 When this effect is examined by the calculus, results are obtained in exact accordance with those of observation. It is necessary to consider attentively this order of facts, and the results of the calculus when we would ascertain the influence of the atmosphere and waters upon the thermometrical state of our globe. The establishment and progress of human society, and the action of natural powers, may, in extensive regions, produce remarkable changes in the state of the surface, the distribution of the waters, and the great movements of the air. Such effects, in the course of some centuries, must produce variation in the mean temperature for such places; for the analytical expressions contain coefficients which are related to the state of the surface, and have a great influence on the temperature. 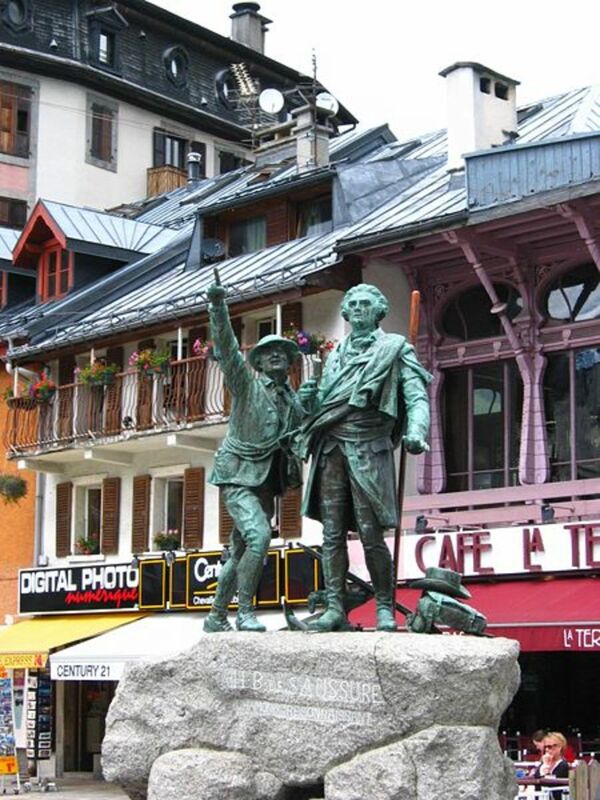 Monument to de Saussure at Chamonix. Image courtesy of Daniel*D and Wikipedia. Perhaps other properties of radiating heat will be discovered, or causes which modify the temperatures of the globe. But all the principal laws of the motion of heat are known. This theory, which rests upon immutable foundations, constitutes a new branch of mathematical science. It is composed, at present, of differential equations of the motion of heat in solids and liquids, and of the integrals of these first equations, and theorems relative to the equilibrium of radiating heat. These observations, and the extensions of the theory to which Fourier contributed, are still continuing to this day. Although this work still continues, we can--by looking back to pioneers such as the able Baron--appreciate the degree to which our certainty regarding factors affecting "the thermometrical state of our globe" has grown. Perhaps we may even gain some helpful perspective on one of the great scientific and political controversies of our day, the question of anthropogenic climate change. This hub is the first in a series. Continue with "The Science Of Global Warming In the Age of Revolution." The life of little-remembered physicist Claude Pouillet--including a particularly dramatic afternoon!--with assessment of his contributions to the science of global warming. Or, continue on to the third Hub, on the life and work of John Tyndall. (The story of Nils Ekholm.) Scientists are expected to live and die on the quality and integrity of their data analysis, but usually that is a metaphor. What prospers or fails is merely their reputation. For Ekholm, the stakes were far higher. In the middle years of the 1890s, the world was trembling on the brink of breakthroughs and breakdowns, and so was the no-longer-quite-young chemist, Svante Arrhenius. . . The life and work of physicist, educator and mountaineer, John Tyndall--and his contribution to the science of climate change. A forest of bayonets, thought Claude Servais Mathias Pouillet, Professor of Physics at the Sorbonne and Director of the Conservatoire royale des arts et metiers, in whose courtyard this unwelcome forest now stood. 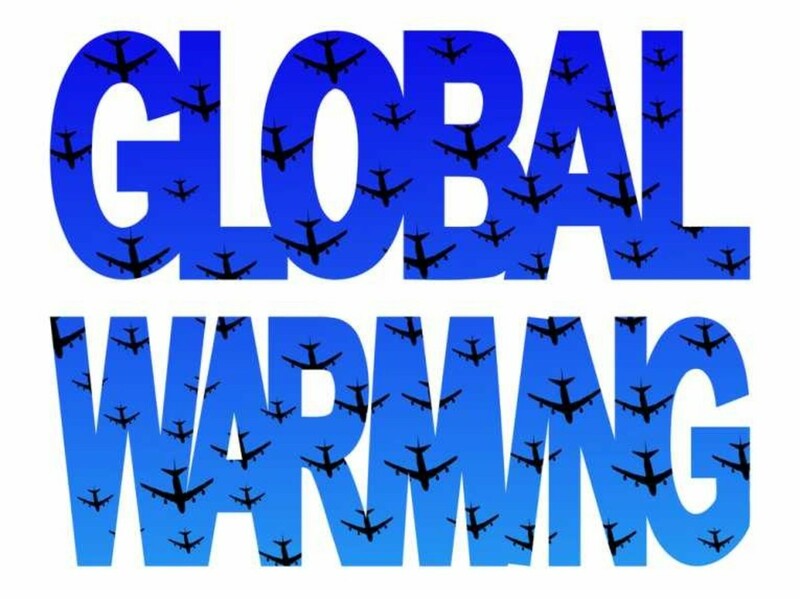 . .
Ralph Deeds updates us on global warming. Thank you. I appreciate your detailed answer. "The Little Ice Age (LIA) was a period of cooling that occurred after the Medieval Warm Period (Medieval Climate Optimum). While it was not a true ice age, the term was introduced into the scientific literature by François E. Matthes in 1939. It has been conventionally defined as a period extending from the sixteenth to the nineteenth centuries, or alternatively, from about 1300 to about 1850, although climatologists and historians working with local records no longer expect to agree on either the start or end dates of this period, which varied according to local conditions. The NASA Earth Observatory notes three particularly cold intervals: one beginning about 1650, another about 1770, and the last in 1850, each separated by intervals of slight warming. 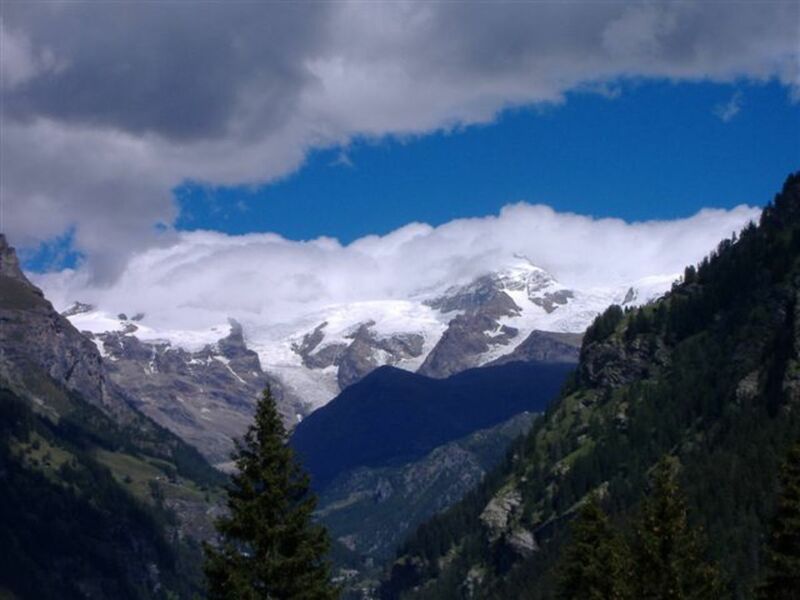 The Intergovernmental Panel on Climate Change Third Assessment Report considered the timing and areas affected by the LIA suggested largely independent regional climate changes, rather than a globally synchronous increased glaciation. At most there was modest cooling of the Northern Hemisphere during the period." I think it's probably more significant that Fourier was working at a time when the geological discipline of 'stratigraphy'--the interpretation of the origin, history and chronology of various layers of rock--was developing, along with geology in general. The idea that the Earth had experienced change over time, in both its geology and biology was new and exciting. Cuvier, for instance, was demonstrating around this time that there had been numerous ancient (and very strange, in some cases!) species that had existed, but which had vanished from the planet. Some proposed that these creatures had perhaps vanished in the Biblical Flood. Others looked to other possible causes. And as the century wore on, it became increasingly clear that Earth had passed through ice ages in the deep past. So the question became, what could account for such drastic changes? That was actually part of the research question that Svante Arrhenius was addressing in 1896, when he hand-calculated the first mathematical model of CO2-induced global warming. Could changing CO2 concentrations in the atmosphere suffice to explain the comings and goings of ice ages? Interesting article. Wasn't the Earth going through a min-Ice Age at that time? Great stuff doc snow. Really good idea to do the back story: too many people think that climate science was called magically into existence with the IPCC! Looking forward to reading more. Thanks for stopping by, adorababy! In short, you could argue that the Age of Napoleon also ushered in the Age of Transformation--in which, I suppose, we still live today. It's an age in which we can be pretty sure that the world we grew up in will differ quite a lot from the world our children live in. I wonder if we are at all prepared for the changes of the coming decades? This post shows that there is more to the Napoleonic era than what we normally know. I guess they wouldn't call this the Golden age if not for the momentous discoveries that we now know of. Thanks very much! Feel free to post a link to your Hub here, as I'm sure it would be of interest to readers. I am glad I found you and just wrote a hub about a book written by Christopher Booker. Thank you for your interesting hub. You're right, Neven. The Weart site is a wonderful resource, and a terrific example of writing for the Web. In a sense, I'm trying to provide a human-interest commentary on that site. 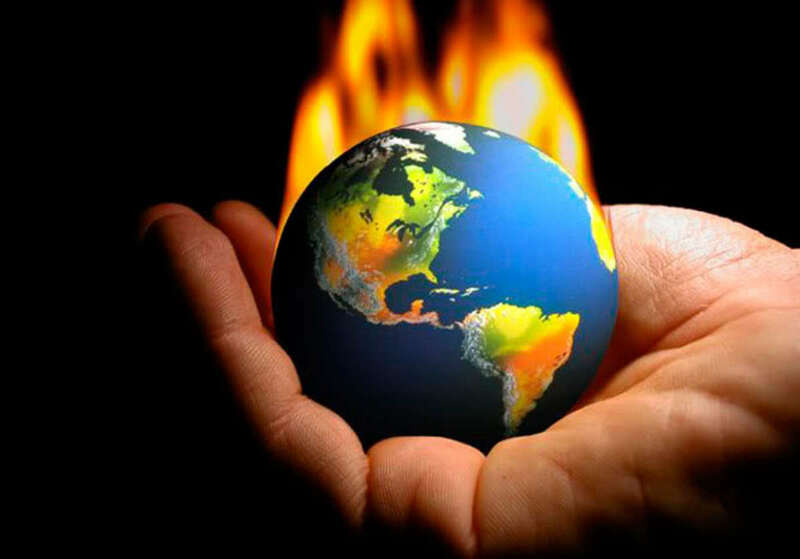 The case appears to be similar with some of the basics of the theory of human-caused climate change, too--basics, such as the radiative characteristics of CO2 and other "greenhouse" gases, or the importance of the greenhouse effect in the natural regulation of our planetary temperature, are firmly established. Many other questions remain--for example, what is the feedback sensitivity of climate to GHG forcings, precisely? Is there a role played by "cosmic rays"? What will regional climate outcomes be, in detail? And will hurricanes be more of a problem, either in terms of frequency or of severity? But we do know more than enough to be concerned about our future, if we continue to fail to curb our greenhouse emissions. Thanks for your kind words--and I hope you'll check back for new additions to the series! My wife left this open for me, thinking it would interest me. It did. Great stuff! It's amazing to think so much has gone on before the current AGW debates. People often think that it's something of the last 10-15 years and many things are uncertain. Reading Spencer Weart's 'Discovery of Global Warming' made me realize there is much, much more to it. Thanks very much, William. I'm slowly working my way forward, so stay tuned! Great idea for a series of hubs! Great writing and pictures too. I'd be interested to see you write about Milankovich. Thanks so much, Ralph! The "back story" deserves to be better-known, IMO. A piece on Arrhenius is in the works--he was the first to construct a mathematical model of the atmosphere to investigate CO2-induced warming--but I can see it's going to take some researching. Even the title continues to elude me! That's a fascinating story. I enjoyed it a lot and am looking forward to future installments. This hub is meant to be the first of a series on "classic" science relevant to the global warming issue. Fourier is a pretty big name in the history of mathematics, but the next "discoverer" I'll highlight--a physicist named Claude Pouillet--hasn't the same degree of renown today, though he was very good (and very energetic!) in his own time. You may enjoy that story, as well, as it involves the last Bonaparte emperor of France--so check back! I should have it up soon. Wow. I had no idea how relevant Napoleon was to global warming. This Hub was great because I actually love learning about Napoleon and the times he lived in.